How well do you know German Shepherds? So, you think you know German Shepherds? Take this quiz to find out how well you REALLY know my FAVORITE dog! Also, please note that I am not a vet or a breeder, just someone who has been studying this breed for a VERY long time. In this quiz, I will be testing you to see how we'll you know the amazing, GERMAN SHEPHERD!!! If you don't score so well, don't worry, there are more than 800 more breeds out there for you! What is the most common color in the working line German Shepherd? What is the most common color for the show line German shepherd? What is the difference between show line and working line German Shepherds? Is the Panda color a purebred German Shepherd? What is the difference between a Shiloh Shepherd and a German Shepherd? What are the coat types and how many are there? 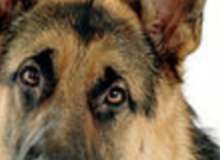 What are the most common health issues in German Shepherds? How much should puppies eat daily? How much should adults eat daily? You can feed them any good quality food, but what brand is specifically meant for them? So German Shepherds make good guard dogs? No, they are way too friendly! No, they are too aggressive, they tried to kill a Girl Scout on my lawn once! What is very important so that they don't become aggressive? How do you pick a good breeder? What's the best for teething? Quiz topic: How well do I know German Shepherds?